The Cuban Missile Creesis, an aa kent as the Caribbean Creesis (Roushie: Карибский кризис, tr. 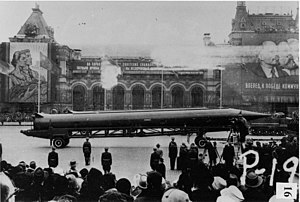 Karibskij krizis), or the Missile Scare, wis a 13-day (October 16–28, 1962) confrontation atween the Unitit States an the Soviet Union concernin American ballistic missile deployment in Italy an Turkey wi consequent Soviet ballistic missile deployment in Cuba. The confrontation is eften conseedert the closest the Cauld War came to escalatin intae a full-scale nuclear war. ↑ Len Scott; R. Gerald Hughes (2015). The Cuban Missile Crisis: A Critical Reappraisal. Taylor & Francis. p. 17. This page wis last eeditit on 5 Mairch 2018, at 06:57.